Over 180 buildings have been marked as defective and due for demolition. The General Manager of LASBCA, Mr Lekan Shodeinde, revealed this to newsmen. He said the owners of the defected had been served several notices since 2013. According to him, demolition of 20 houses had already begun today, Friday. According to him, the agency's task force has already began with the demolition of a three-storey building on 60A Freeman Street, Epetedo. 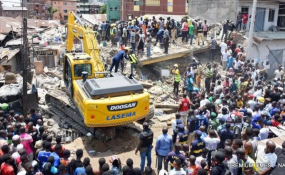 Meanwhile, the Lagos State Government has confirmed that a total of 20 people died in the collapsed three-floor building at number 10 Dogara Street, Ita-Faaji, Lagos Island. The building housed a private Nursery School, Baden School, residents and shops on the floor of the structure. Out of the 20 causality recorded, 16 were pupils of the school while the remaining four were adults, the state Commissioner for Health, Dr. Jide Idris and General Manager, Lagos State Emergency Management Authority, LASEMA, disclosed.